SUE Solutions contracted with Ensign Engineering to perform Subsurface Utility Engineering Services (SUE), in the form of Quality Level B utility designating on the Shoreline Ridge ALTA / ACSM Survey project, located on the University of Utah Campus, in Salt Lake City, Utah. The project is to include the grading out and removal of an existing “common” area, in order to construct a new “student common area” pavilion area within the Shoreline Ridge Student Housing area. 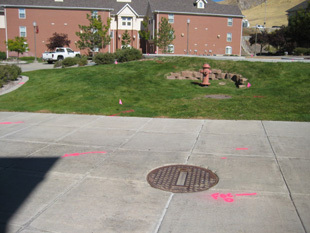 The project area has been a long-time “problem area” for the University of Utah Facilities Management Department in regards to the existing utilities and their respective locations. Due to this occurrence, SUE Solutions was contracted to perform the utility designating, in hopes of identifying the horizontal locations of the existing utilities. All utilities within the project area are considered “private”, and are not part of the local Blue Stakes One-Call program. 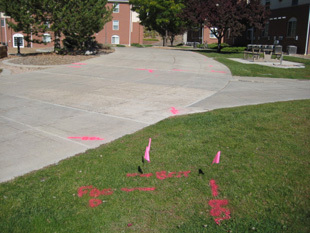 SUE Solutions met with University of Utah Facilities Management staff to discuss the project and obtain any possible utility mapping that was available. SUE Solutions successfully designated over 1,700 lineal feet of existing “private” underground utilities not previously mapped or accounted for. Utilities designated included buried electrical, fiber optics, natural gas pipelines, culinary water lines, storm drain mainlines and laterals, and sewer mainlines. A comprehensive report containing utility descriptions and limitations, and Quality Level B photographs were provided to Ensign Engineering as a Final Deliverable.